During my years campaigning against fluoride in the water I learned 3 key lessons I’d love to share with you. You strengthen what you oppose. By fighting against fluoride I was giving all of my energy and attention to the problem. After a few years I burned out and lost my creative energy to keeping going. What you focus on grows. When I reached the end of the line fighting against fluoride a whole new path opened to me which taught me that what you focus on grows. Instead of focusing on the problem, focus on the solution which is pure water. Genius. Your resonance creates your environment. If you don’t like what you see and experience, resonant a new story. This is tricky because your mind loves to hone in on what you don’t like as opposed to seek out what you do want. Change is scary. It requires us to move from fear to trust and take steps into the unknown. Trust that you can resonate your new story and take the easiest step in that direction. My approach with the fluoride issue is to empower you to become aware. If needed install a water filter to remove fluoride, chlorine and heavy metals from your drinking water. Take action to take great care of your teeth and body. Be the change you want to see and let your life be the message to those you connect with. You hold so much power to create change when you approach life from your inspiration. This message is an invitation to take full responsibility for your health and life. One step at a time. With trust that you’re exactly where you’re meant to be for everything to unfold from here. Now, I’d love to hear your insights in the comments below! All of us are born into tribes- we have families, friends, race, nationalities and other social groupings. The tribe creates the rules for living and the structure of your reality, telling you who we are within it and how to behave. To feel safe and accepted people follow tribal rules as by nature we are tribal and we long to belong. Some people embrace the tribal mindset all their lives, never imagining anything else beyond its values, and established limitations. I didn’t embrace the tribal mindset due to my upbringing with my Mum who always encouraged me to foster my dreams and think outside the box. In my years of campaigning to end water fluoridation in Ireland I challenged the tribal mindset and it wasn’t easy. It was one of my greatest learning experiences as the tribe closed ranks using their protective mechanisms of anger, cognitive dissonance, rejection and resistance. Who was I to oppose the medical system who upheld the water fluoridation policy? Who was I to challenge the law that had been in place since the 60’s, ethically approved by the Catholic church and supported by Ireland’s conservative parties? I was someone who had stepped outside the tribe and brought awareness to their unjust, undemocratic law that was damaging people’s long term health. When we challenge the rules of the tribe we challenge people’s sense of safety and their source of validation. The thought of any change makes the ego feel like it’s going to be annihilated as people’s sense of identity is tied into the system they uphold. It took time for my extended family to listen to the issue, but this was after multiple exposures to the information, mostly gleaned from magazines and newspapers- the reference points that reflect their reality. It took even more time for others to switch over to filtered water so great is the pull of the collective tribal mindset. What I learned from my years as an active campaigner is that change does not happen overnight and that it can only arise from a certain level of awareness and consciousness. Coming up strongly against the system, I was met with a backlash of resistance as the medical system and the legal system closed ranks to ensure the protection of the water fluoridation policy. There were and still are some wonderful brave hearts who stood with me, outside Leinster House, outside Chemifloc (the company that supplies fluoridation chemicals to Ireland's drinking water), outside the Department of Health and at other awareness raising events in the country. We believed that we were going to make a difference. We believed that we were the ones who were going to make the government see the error of their ways. Yet the purest of intent fell on deaf ears because the majority preferred to stay within the safety of the tribe. It didn’t matter that we had the science and truth on our side. After much reflection I began to realise that what we need is an alternative tribe of people who want to learn to master their energy and health on all levels. It’s necessary to detach ourselves from the tribe to follow our own evolutionary journey. As you master your energy and raise your consciousness you radiate that energy outwards. This indirectly influences those you live with, work with and people in our community. The internal shifts you make eventually creates external change. Releasing your belief of obligation to the tribe opens up your energy pathways to enter the unknown where all new possibilities enter. You disconnect from the tribe so that in time you can reconnect at a higher level of interconnectedness. Moving from codependency where you need to be uniform to fit in to interdependency where you have unity within diversity. If you want to create a new reality, then you need to evacuate from the unevolved tribal mentality that’s clinging to the old system. Familiarity may make us feel safe, but it also stifles growth as sameness leads to stagnation. We cannot change the current system. We can only transcend it. The only people who can do this is you and I who are called to do this work from a place of joy, mutual support and a deep inner knowing that we’re here to lift the planet to a higher reality. It’s not easy to step away from the mainstream without support which is why I created a membership for a community of trail blazers who are on the path of self discovery. Learn More about Energy is Your Currency Membership. Click this link. Today’s the Winter Solstice which is the shortest day of the year. As the day shorten there’s a sense of drawing inwards as the light diminishes. I’ve the urge to clear away any energy that’s heavy and restrictive. Emotional baggage that hasn’t been dealt with comes up now to be resolved. If we miss that opportunity and suppress how we feel, we go into the New Year held down with the debris of the old and prone to the January blues. The energy of the Solstice provides a wonderful opportunity to cleanse and purify on all levels. The Celtic Druids were very much aware of this and underwent ritualistic cleansing in sweat lodges. The Winter Solstice was a time of renewed hope and change and they used this opportunity to rid themselves of what they no longer needed for the coming year. I don’t know about you but I feel a deep urge to clear my personal space of anything that no longer serves me. The car is loaded with stuff for the charity store and the recycling centre and it gives me such a sense of lightness of being. Along with clearing on the outside I also lighten my diet for cleansing on the inside and adding in my much loved detox methods; Epsom Salts baths, Fragrance Alchemy, bentonite clay face mask and an infrared sauna. The Solstice is the time to take stock of what we have and what we want to get rid of. We are creating space for the new to emerge in our lives. 1) Create space for the new to emerge in your life. Declutter your personal space. It’s so good to feel lighter. 2) Celebrate your victories and achievements of the year. Celebration is a Goddess principal that imbues your life with magic and meaning. 3) Acknowledge the things that didn’t work so you can refine your approach. Appreciate the insights gained. Write a letter to the future self you wish to embody for the coming year based on wisdom gained this year. 4) Replenish your energy. Rest, eat nourishing foods and drink plenty of hydrating fluids that make you feel cherished and cosy. 5) Nostalgia pulls us into the energy of the past. Let it go. Remember that feelings of melancholia arise when we anchor our happiness onto expectations of past experience. Focus on the present moment. 6) Foster what is real and natural. Light natural beeswax candles and connect with the light. 7) Spend time with people you love and who love you. Open your heart to the love that is always available. Stories passed down over the centuries give us a snapshot of Celtic rituals performed. The Druids would bring a live tree indoors at the Solstice for wood spirits to have a warm place during the cold winter months. Afterwards the tree would be replanted. I wasn’t aware that this was a Celtic tradition but for the past few years we have brought a growing tree into the house to be replanted in the spring. It smells divine and so real. I feel anchored into my soul when I connect with what’s real. Enjoy your festive season and most importantly be your true self. I love the Christmas season as it lights up the darkest and possibly the coldest time of the year. During this season of goodwill and cheer people tune into the high Solstice energy that prompts an opening of hearts and desire to gift our loved ones. This time however does not come without its stress, wondering what to get for whom and whether or not they will like it. So this year I am compiling a list to help you give the gift that makes a difference. 1) Kate Northrup’s Money, a Love Story: Untangle Your Financial Woes And Create The Life You Really Want This book helps you to write a new story with your money. Kate teaches how money is all to do with your personal power and self value. It shows how to create a healthy relationship with your money so you can create abundance and financial freedom to live the life you want. 2) Gabrielle Bernstein’s Judgement Detox. Release the Beliefs That Hold You Back from Living a Better Life. This is a guide to healing your relationship with judgement that can prevent us from fully participating in our relationships. Based on The Course of Miracles, this book is a six step approach to releasing judgement and resentment. This is essential to raising your consciousness and to attract new opportunities to create the life of your dreams. 3) Bringing Death to Life by Patricia Scanlan, Dr Mary Helen Hensley, Aidan Storey and Pamela Young. I had the pleasure of meeting Mary Helen Hensley at an event this year and her story healed me in so many ways after losing my dear Mum this year. I highly recommend this book for anyone who has lost a loved one or has a fear of death. This is a game changer. 4) Jonathan Acuff’s Finish: Give Yourself the Gift of Done. This book outlines the reasons why 92% of New Year’s resolutions fail and what you can do about it. Learn about how fun and taking the pressure can be more helpful to you achieving your goals. This is a must read for those who find it easy to start things but who fail to finish. This book will make you feel alive with new possibilities. 5) Medical Medium’s Liver Rescue is the ultimate guide to reclaiming your health. This book is one of my go to resources for making health choices both for myself and my clients. 6) I love Dr Bronner's products. They are so gentle on the skin. They're made from organic ingredients with perfectly blended essential oils. Choose from either the soaps or the liquid soaps. 7) Skin can feel dry and taut from indoor heating. Dr Hauschka’s Rose Day Cream Light is ideal for dry or sensitive skin. It is super hydrating and you only need to use a little to cover your skin. 8) I recommend Dr Hauschka’s foundation as it only uses organic natural ingredients and does not use animal testing. It blends really well and doesn’t cake. I find that it lasts all day and gives incredible coverage. 9) Treat yourself to a homemade face mask made from Bentonite clay over the holidays. This is amazing to make your skin feel so fresh and soft. Bentonite clay draws out toxins from the skin making it deeply cleansed like you had a facial. This is wonderful value for money as the container lasts for ages. 10) Christmas is not Christmas without the customary pjs and slippers. I love the North Face slippers that are like a puffa jacket for your feet. If you are like me you love your feet to be cosy and warm, these North Face slippers are quite a treat. 11) If you have not already invested in a rebounder then think about getting one this year as it really makes a difference to fitness and tone. I recommend the Fit Bounce Pro as it’s durable, of high quality and doesn’t make any squeaky springy noises. Rebounding benefits have been recognised by NASA. It is so easy to exercise using the Fit Bounce Pro during the cold winter months when you feel more like cocooning than exercising. I hope you choose the best gifts for you and your loved ones. Have a wonderful holiday filled with joy and health and happy new year for 2019. This week’s Q & A is about celery juice. Question: How do you prepare this Aisling? Is eating celery sticks raw the same, or do you have to juice it? What is the difference between the juice and the celery by itself as it is? Answer: Thanks for a great Question! First off I’d like to tell you that I wish I had of known of the life changing health benefits of celery juicing way sooner. I was walking past celery in my supermarket and markets not paying it any attention. Instead I was chasing other health trends, many of which ended up hurting my health and not helping. There is a big difference between eating the celery sticks raw and juicing them. First off you can’t possibly eat the amount of celery you can juice. It’s recommended to drink 1 whole bunch of celery in the morning on an empty stomach. By juicing the celery your body gets a massive boost of live enzymes, minerals and vitamins. Don’t get me wrong eating raw celery is still helpful but not nearly as powerful as juicing celery. I juice a whole bunch of celery and add chopped up sticks one by one into my Green Star Juicer. I enjoy serving my celery juice in either a martini glass or fine wine glass for a touch of glamour to the occasion. Celery juice is most powerful when you drink it SOLO. Quickly rebuilds your hydrochloric acid so that your stomach can break down protein. If protein isn’t broken down properly it will cause gut rot. Strong hydrochloric acid is important to kill off pathogens entering your mouth. Celery Juice increases and strengthens your bile. Strong bile is important for the break down fats, and for the killing off pathogens; that have made their way into your body. Eating straight celery wouldn’t allow you to get enough of celery’s cluster salts; that acts as antiseptics for pathogens. I’ve added celery juice to my routine and I can honestly say my nervous system has never been stronger despite going through one of the toughest years of my life with my Mum passing away in May. I hope you are inspired to include celery juice in your life. Let me know how it goes in the comments below! Since learning about the Medical Medium protocols when my Mum got sick, I’ve been studying his books and blog intensely over the past few months. One of the Medical Medium (MM) key protocols is to include celery juice in the morning on an empty stomach. At first that sounded overwhelming and I put it to one side but the more I learned about the benefits, the more inspired I was to try. I want to share with you the top 3 benefits to inspire you to include celery juice in your life. Celery juice is most powerful when you drink it solo. While it’s great to consume other green juices or vegetables juices and add in items like spinach, kale, parsley, cilantro, or apples, drink those mixed juices at a different time than your straight celery juice. These blends function differently than what Medical Medium recommends as your greatest tool for recovering your health: pure celery juice taken on an empty stomach. If you drink your celery juice first thing in the morning, it will also strengthen your digestion of foods you eat for the rest of the day. I recommended starting with half a bunch of organic celery and work up to using one whole bunch of celery for maximum health benefits. Simply put your celery sticks into your juicer, pour into your favourite glass and enjoy deeply nourishing your glorious body. You can read all about celery juice in the Medical Medium Life Changing Foods Book. Let me know if you are inspired to add celery juice to your life or are you already celery juicing in the comments below. Serve with your salad, wrapped inside a nori wrap or with carrot sticks and cucumber slices. Delicious and nutritious. The nutrition fun fact is about sesame seeds which is what tahini is made from. Do you freak out when it comes to your money? This week I have made some major progress in terms of how I’m making peace with how things are. I am beginning to see the underlying perfection of life after being buried in a haze of trauma since my Mum became suddenly ill in February and passed away in on the 10th May. In Energy is Your Currency Membership I am teaching exactly what I need to learn and master. The month of September we have been practicing a 30 day Root into Your Power Practice. What I’ve learned from this is that I cannot root into my power when I resist what is happening in my life. It is when I soften into surrendered trust that I can feel I am held by the Universe. When you contract into a perspective that sees everything as wrong and that the world is against you, you cut yourself off from your power. It is a tricky one to practice, especially in the face of trauma and overwhelm. But, you have a choice in each moment how you perceive your life. A simple reframe I use in my practice is asking myself “What is the lesson and what is the gift?”. This simple question can lead to profound shifts as it enables you to move from feeling victimised to seeing yourself as co-creator with life. Co-creating with life isn’t always easy or how you expect things to unfold which is why it is necessary to understand that life is a mystery and we can’t always explain why things happen the way they do. I met a lady yesterday who knew myself and my Mum and she asked me “how are you coping” and I answered I have lots of support to help me. As I said this I realised the biggest support I have is my own self and that this experience is giving me the gift of learning how to hold myself, love myself and own my power. My energy completely expanded as I said this and I rooted deeper into my power. Having a daily practice is essential to your health and wellness. The reason we practice is Number 1 to feel well and Number 2 to give us the reserves that handle what life brings to us and Number 3 to raise our awareness and levels of consciousness so we can bring our best self to our life. Yesterday I felt deflated and emotionally exhausted. I had agreed to record a weekly podcast with Richie and everything felt too much. After a conversation with Richie I realised it is me who is setting my rhythm and I can change the pace to suit me. I was reminded of the famous quote my Mum always said "Simplicity is the key to success". No truer words were said. So I decided instead of putting myself under unnecessary pressure I will change things up and instead record X 2 podcasts per month and on the other week post what I am learning and discovering. If you have been following me on Facebook and Instagram you'll see that I'm cooking up lots of tasty creations in the kitchen. Tonight I'm making falafels for the very first time and I'll be sharing the process on my facebook page. I'm honouring how I feel at the moment and going through my process of healing. This involves being very gentle and providing lots of nurturing. I hope that this message inspires you to simplify an area/areas of your life so you can enjoy this moment fully and deeply. Light (from sunlight and blocking blue light), Water (pure filtered water), and Magnetism (grounding onto the earth). Matt created the Vegan DHA Cymbiotika due to the gap in the market for a pure DHA that is non gmo and not fed high fructose corn syrup. DHA is needed as people are 90-99% deficient in DHA as it is drained by artificial light and EMFs. Our cells can emit, absorb and hold light. By supplementing with DHA we increase our cell membrane integrity so we can absorb and hold more light. Light is accessed information so as we increase our light, we evolve at a rapid level. Most of our mitochondria is in our brain, eyes and heart. DHA improves our mitochondria function that drives our energy in our cells, organs and body. Grounding; barefoot walking and grounding mats for indoors. Water filters to purify your drinking and cooking water. Shower filters to remove chlorine from your showers. Nascent Iodine to detoxify fluoride, iodine and bromine. Vegan Cymbiotika DHA to improve your cell membrane function and integrity. 1 serving is 1,000 mg and 1 bottle lasts 30 days. Currently in Europe Chi Whole foods in Bristol UK is stocking Matt's Cymbiotika. I'm contacting an Irish Supplier to see can we get it available to order here. I'd love to hear from you, what action are you going to take to upgrade your body today? In today's episode of Aisling's Holistic Health Show I interviewed the wonderful insightful Leslie Van Oostenbrugge who goes by the name of The Awakening Dentist. I was very intrigued when I first came across Leslie's work as I have been campaigning for years as The Girl Against Fluoride and it hadn't dawned upon me that instead of fighting against the system, I should be focusing my energy on creating a new system. Leslie is doing just that. Leslie is an contributing author in the book Time to Rise In Time to Rise, Dr. Andrea Pennington presents 29 inspiring tales of people from various backgrounds and cultures who didn’t let tragedy and defeat hold them back. They discovered that the ability to follow your heart, listen to your intuition and bounce back after stress can be strengthened. These stories cover events ranging from dealing with stress on the job and healing from divorce to overcoming eating disorders and healing from trauma. Leslie has been a practicing Dentist for 20 years in Holland. For the past 10 years Leslie has been on a journey of awakening, remembering that we come from Source and that we are souls having a human experience. Leslie's top tips for dental health start with standing in the mirror and smiling at yourself. Becoming aware of your teeth and having a daily practice of flossing with interdental brushes and brushing away the plaque. Plaque contains bacteria and sugar causing the PH to go low and causing cavities. It is a life practice of taking care of your teeth. Leslie started with changing 3 negative thoughts into new thoughts. Her pioneering work is creating a new paradigm bringing awareness to yourself and remembering you come from source. This is a journey of coming home to yourself and it begins with loving you and your teeth. Leslie has her first book Drilling into Your Emotions coming out this year. I'd love to hear from you, what was your biggest insight for this week's episode? Let us know in the comments below. Last year I started asking myself a lot of what ifs. What if there was an online community of people who wanted to come together on this path of evolving consciousness? What if there were people out there who wanted to be taught self-mastery tools in a group each month that could also learn from one another as they integrated the content into their own lives. At the time I was teaching a group course called Trust is Your Default Setting and found that when it was over there was no space for people to go. Today I'm launching Energy is Your Currency Membership as the space to support you on your evolutionary journey. Enrollment is open Wednesday 31st January - Wednesday 7th February. A monthly masterclass. The first month is on the Energy is Your Currency Philosophy. A How To video to practice the theme of the month. A Live Q & A hosted in our private Facebook community to answer your questions from the month. Special bonus material to make being a member of Energy is Your Currency light up your world in ways you never thought possible. Energy is Your Currency Membership is 65 Euro per month and is a space where I pour my very best content to keep you on track with living your full potential. I attended the Pendulum summit in Dublin last week. It was my first time at this impressive event with Inspirational Speakers from different walks of life- Sport’s people, Business owners, Motivational Speakers and Global Authorities on leadership. It was a lot to take in as everyone’s perspectives and journeys are different, but I managed to take away some valuable nuggets that I want to share with you. Randi Zuckerberg’s talk centred on the value of turning away from the outside world to connect with what you want to create. She cautioned discernment on the use of technology. Joe Malone, business entrepreneur spoke of how belief in herself and her product enabled her to push forward with her ideas even when resources were scarce. Paul O’ Connell shared how mastering the moment helped him to value the process, rather than the outcome. This shift in perspective reduced his pressure and panic, allowing him to enjoy playing Rugby and improve his performance. Martyn Newman, the global authority on leadership and emotional intelligence focused on the importance of emotional wellbeing on one’s capacity for success. 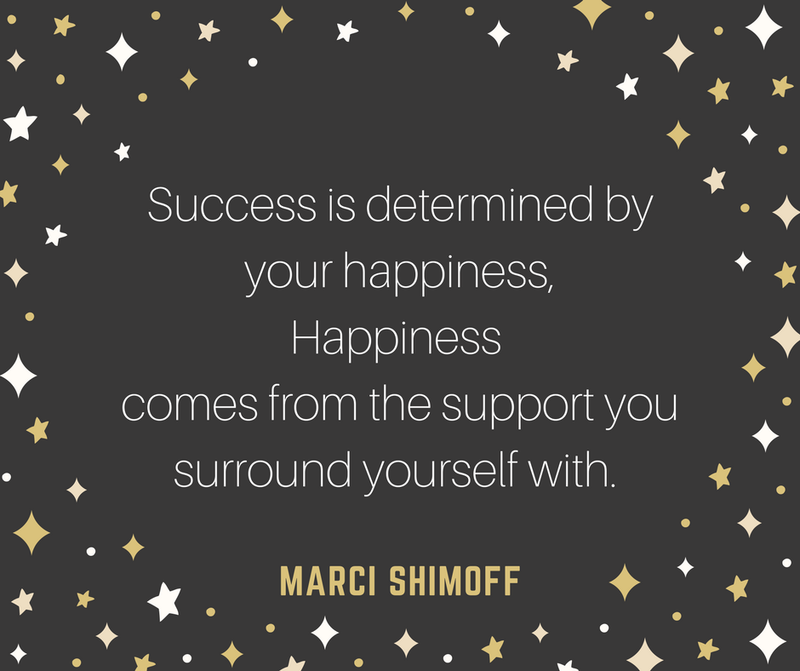 Marci Shimoff, the Happiness expert, co- author of Chicken Soup for the Soul series and author of Love for No Reason and Happy For No Reason was a complete tonic. She spoke of the importance of surrounding oneself with supportive people calling it the home for happiness that provides conditions for blossoming. I was delighted to see that emotional intelligence has entered and is being acknowledged in the business world. Those who are happier are more likely to be engaged in what they do and to be committed enough to their vision to see it through. What I had witnessed with all the speakers was their outcome of their success and a glimpse into their own particular journeys. I know that it is challenging to navigate your journey on your own. 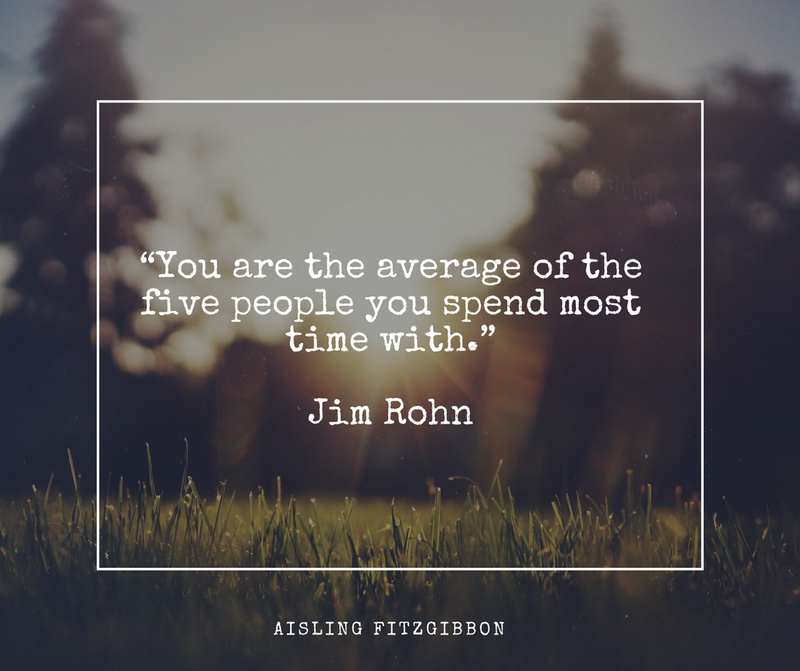 Success is highly dependent on those you surround yourself with. It can be discouraging when people don’t support your dreams because they tend to quench your fire and enthusiasm. Having the right people around you to help cheer you on even when you feel like giving up makes all the difference. This has led to my decision to launch my Energy is Your Currency Membership. This is a space for you to gain clarity on your intentions, nurture your dreams into reality and connect with like-minded visionaries. The inner strength to stay on your path emerges when supportive conditions are provided. In the membership you will be provided with the tools and techniques to master your evolutionary journey and to blaze a trail on the path into the unknown. Doors are opening on 31st January and close 7th February. I know that for many people, resolutions made in January are discarded by February as we slide into old habits and familiar comfort zones. When motivation wanes, we blame our lack of willpower, time constrictions or whatever distractions get in the way. There is always next year of course until it comes around again. Last year I made lots of plans - goals I wanted to achieve in both my personal and professional life but they were too outcome driven and vague. I didn't honour the process, always in a hurry to get to the next task. This made me feel stressed with little time for reflection and consolidation. I am very much aware that as we shed our old story to create the bigger vision of our life, we need support. I know, from experience, how isolating and confusing this journey can be, which is why I’m creating a monthly membership programme. In the membership site you'll find the tools to help you gain clarity and tips on how to manifest your intentions. This will be a place to be accountable, even when you’re unsure and want to give up. It will become a hub of education and support where you'll learn how to track your progress, reduce distractions and work towards intentions that can be incorporated into your daily life. Click here if you want to find out about the Energy is Your Currency Membership site. Doors are opening on the 31st January and closing on the 7th February. In the final hours of 2017, Richie, my fiancé, and I reviewed the past year, reflecting on our mutual celebrations, challenges and lessons we’d learned. We were at home, wearing our Christmas slippers and in a reflective mood. The exercise really helped as it focused attention on our achievements, obstacles and progress made during 2017. We did this exercise separately and then shared the results with one another. This exercise was a letter to our future selves that we plan to open on 31st December 2018. The letter also contained intentions for the year (also written into my 2018 diary) and actions I need to take to make them a reality. To keep ourselves on track and to share our journey with people, we decided to do a podcast together called The Aisling and Richie Show. This podcast will document our experiences in 2018 as we endeavour to make Trust our default setting on our journey into the unknown. I will also be accountable to my future self on the 31st December. Last year one of my greatest challenges was to move from fear to trust- to have faith in the way life was unfolding, rather than contracting in fear when things were not going according to plan. For example, I was happy working with clients in one to one programmes but the opportunity arose for me to run a group programme. I knew this was my next step but the limited me wanted to wait for a few more months until I knew more, was more skilled, was more comfortable with the idea of running a group. You know what? I realised that before I go into any major expansive growth period in my life, I would contract and dream up a hundred reasons why I shouldn’t go ahead. Fear talking. Once I took that first step towards advertising my group programme, the fear began to dissolve. I taught a course Moving from Fear to Trust as this was the lesson I had to learn for myself. Another challenge for me is to not attach to outcomes. This is an ongoing lesson for me as I can tend to jump into the, as yet, unlived future and obsess with the end result. A sure recipe for stress, frustration, and blocking progress. I had to learn to take one step, one decision at a time and to trust that I was on the right path. I had to learn the true meaning of valuing the process instead of focusing on the outcome. This shift in consciousness has led me to be more open to what the Universe intends for me. This feels so much better than when I was in a place of continual striving. A huge achievement for me was to acknowledge how I’d evolved since my former years as an active outer campaigner. I learned that during the early stages of awakening it is common for many people to protest against injustice. In my case it was to protest against the water fluoridation issue. However as with any stage in our life, we also evolve our own awareness and understanding. I could not remain in warrior mode and moved towards a more sustainable inner activism- where we create the changes within that we want to see in the outside world. We focus on what we want to create rather than giving our attention and energy to what we don’t. This is an indirect way of creating change in our outer reality. One of my greatest celebrations of 2017 was in experiencing first- hand the power of community while on a journey of growth and development. It was an honour to hold the space for some amazing people in my group programme. Opportunities were provided for them to learn from one another, to feel comfortable enough to shed their old story, to develop their new story and to be heard for who they really are. This experience prompted me to move again beyond my comfort zone, to developing a monthly membership programme – to provide people with a community that supports their transformation in a gradual, gentle and guided approach as they work on their self- mastery. I am launching Energy is Your Currency monthly membership on the 31st January. Before I closed the door on last year, I acknowledged what made me happy, what challenged me, what I had learned and how I overcame obstacles. This exercise was instrumental in me feeling more buoyant, grateful and positive beginning the New Year. If you want to do something similar, you could, if you feel inspired, answer the following questions and let me know in the comments below if it helps. 1) What were your celebrations and challenges in 2017? 2) What was the number one lesson you learned in 2017? 3) What are your intentions in 2018 and what actions will you take to bring them into form? I wish you all the best for 2018. Health. Happiness. Adventures. Opportunities. Lessons. Love. Peace and Trust. Please share your biggest takeaway in the comments below. I'd love to hear from you. Add 2 cups of cacao powder to a large mixing bowl. Add 2 cups of coconut sugar to high speed blender and blend of high until finely milled. Mix in the finely milled coconut sugar to the cacao powder. Bring a pint of water to the boil in a sauce pan and place a ceramic bowl that fits over the saucepan to melt the cacao butter. Once your cacao butter is fully melted add to the cacao powder and coconut sugar and mix until fully incorporated. Add 1 and 1/2 teaspoons of Vanilla Extract or 1 teaspoon of peppermint extract and a pinch of sea salt. Using an Electric whisk blend the chocolate mixture to ensure it is fully blended. Add your goji berries and almonds and stir. Once ready place in the fridge to set. Leave overnight and then take out the next day to pop chocolates into a airtight container like a Pyrex dish with a lid. Keeps up to one week in the fridge. 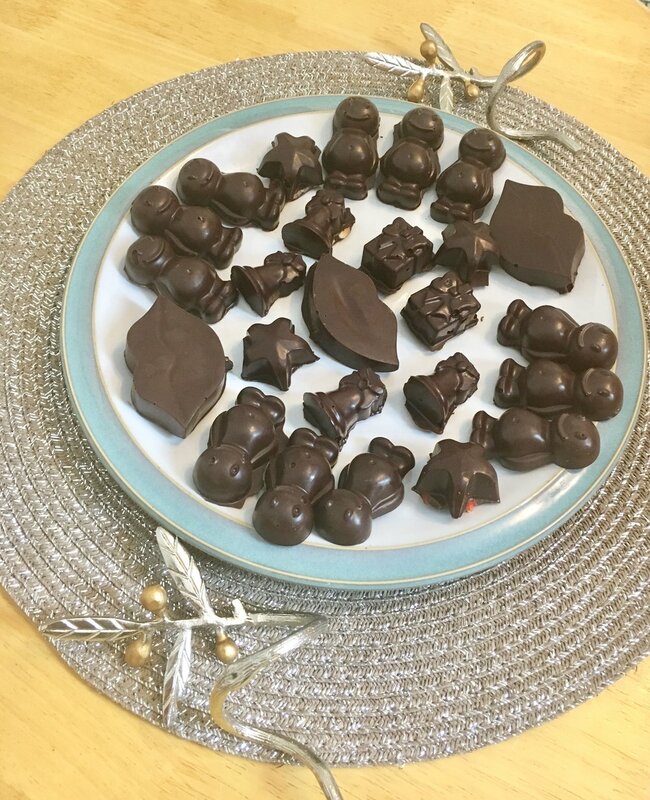 As these homemade chocolates are nutrient dense they are incredibly filling so it is hard to overeat them. What I like to do is just leave out 1-2 chocolates per person and keep the rest in the fridge. Really take your time to enjoy them as you have created your own homemade chocolate and you will never look at chocolate in the same way again. Let the love affair begin. We are tumbling towards the shortest day of the year culminating in the Winter Solstice on the 21st December on Thursday. As the days shorten there is a sense of drawing inwards as the light diminishes. I have the urge to clear away any energy that’s heavy and restrictive. Emotional baggage that hasn’t been dealt with comes up now to be resolved. If we miss that opportunity and suppress how we feel, we go into the New Year encumbered with the debris of the old and prone to the January blues. I don’t know about you but I feel a deep urge to clear my personal space of anything that no longer serves me but it might serve someone else. The car is loaded with stuff for the charity store and the recycling centre and it gives me such a sense of lightness of being. Along with clearing on the outside I am also lightening my diet for cleansing on the inside and adding in my much loved detox methods; Epsom Salts baths, bentonite clay face mask and infrared saunas. · Create space for the new to emerge in your life. Declutter your personal space. It feels so good to feel lighter. · Celebrate your victories and achievements of the year. Celebration is a Goddess principal that imbues your life with magic and meaning. · Acknowledge the things that didn’t work so you can refine your approach. Appreciate the insights gained. Write a letter to the future self you wish to embody for the coming year based on wisdom gained this year. · Replenish your energy. Rest, eat nourishing foods and drink plenty of hydrating fluids that make you feel taken care of. · Nostalgia pulls us into the energy of the past. Let it go. Remember that feelings of melancholia arise when we anchor our happiness onto expectations of past experience. Focus on the present moment. · Foster what is real and natural. Light beeswax candles and connect with the light. · Spend time with people you love and who love you. Open your heart to the love that is always available. Stories passed down over the centuries give us a snap shot of Celtic rituals performed. The druids would bring a live tree indoors at the Solstice for wood spirits to have a warm place during the cold winter months. Afterwards the tree would be replanted. I was not aware that this was a Celtic tradition but for the past few years we have brought a growing tree into the house to be replanted in the spring. It smells divine and so real. I feel anchored into my soul when I connect with what is real. Enjoy your festive season. Be safe. Be well. Be happy and most importantly Be yourself. If a baby could talk they’d ask for organic cotton. Organic cotton doesn’t use pesticides or insecticides and uses environmentally friendly methods of production that avoid bleaches and metallic dyes. These can cause skin rashes and allergic reactions in babies. In other words, it is far safer for babies to be exposed to organic cotton as their skin comes in close contact to what they’re wearing. It was when Nadia gave birth to her daughter that she realised the gap in the market for fresh and original clothing. Using her skills as an artist qualified in Print and Textiles from (NCAD) National College of Art and Design and working on her father in law’s printer she began to produce baby clothing. It was from her desire to create clothing from the softest of cotton that led Nadia to source premium organic cotton for her business. This was how she learned first- hand of the importance of ethically made fair trade clothing made from certified organic cotton. She became aware of the health effects on farmers who don’t grow organic cotton. Exposure to toxic chemicals can cause lymphoma. Nadia’s outfits are handprinted in Ireland and have fun and quirky designs. This super soft range of clothing for babies are made with eco friendly inks. Check out Nadia's latest collection- Bamboo Forest. The clothes can be washed over and over and eventually become family heirlooms passed onto other new members. Nadia’s products are sold in stores throughout Ireland, in countries abroad, and online where there is 15% off your first order. When we buy organic clothing, we are fostering organic farming. Consumers can invest in the health of the current generation and generations to come. I love the Christmas season as it lights up the darkest and possibly the coldest time of the year. During this season of goodwill and cheer people tune into the high Solstice energy that prompts an opening of hearts and camaraderie. This time however does not come without its stressors, wondering what to get for whom and whether or not they will like it. So this year I am compiling a list that may help you to give the gift that makes a difference. 1) Kate Northrup’s Money, a Love Story: Untangle Your Financial Woes And Create The Life You Really Want This book helps to craft our relationship to money which as we know represents our personal power. It shows how to create a healthy relationship with our money so that we can create abundance and financial freedom to live the life we want. 2) Gabrielle Bernstein’s Judgement Detox. Release the Beliefs That Hold You Back from Living a Better Life. This is a guide to healing our relationship with judgement that can prevent us from fully participating in our relationships. Based on The Course of Miracles, this book is a six step approach to releasing judgement and resentment. This is essential to raising consciousness and to attracting new opportunities from a place of higher frequency. 3) Danielle LaPorte’s The Desire Map Planner 2018. This is a must for people who want to balance busyness with reflection and connection with how they want to feel. I am a huge fan of Danielle LaPorte who asks us how we want to feel. This leads us to greater awareness and charts our response to our actions. Each page has a thought provoking soul question and has room for your schedule. When a new month begins you are asked to reconnect to your core desired feelings, your goals and intentions. I ordered one last year – it reminded me to do things in the way I wanted to feel. Truly revolutionary. 5) Danielle Walker’s Against All Grain Celebrations is a cookbook that should be in every kitchen. It is ideal for people who choose to avoid grains and who want delicious paleo recipes that don’t compromise on flavour and taste. 9) Treat yourself to a homemade face mask made from Bentonite clay over the holidays. This is amazing to make your skin feel so fresh and soft. It is really helpful for people with acne and blackheads as it helps to draw out the toxins from the skin. This is wonderful value for money as the container lasts for a long time. 10) Christmas is not Christmas without the customary pjs and slippers. I have had a pair of Devalverde slippers that have lasted for years so this year I have ordered another pair. They truly are gloves for the feet and yes my Grandmother owns a pair and swears by them so I'm keeping a family tradition alive.